My wife Margaret and I keep a small bucket list of ongoing Sierra trip ideas. Some are new, but many are returns to memorable places from years ago. Last week we enjoyed a nine-day journey in Kings Canyon, returning to the White Divide and Goddard Creek via Lamark Col. We decided to revisit the exquisite basins we remembered from our traverse of the White Divide in 1983 - long before kids! 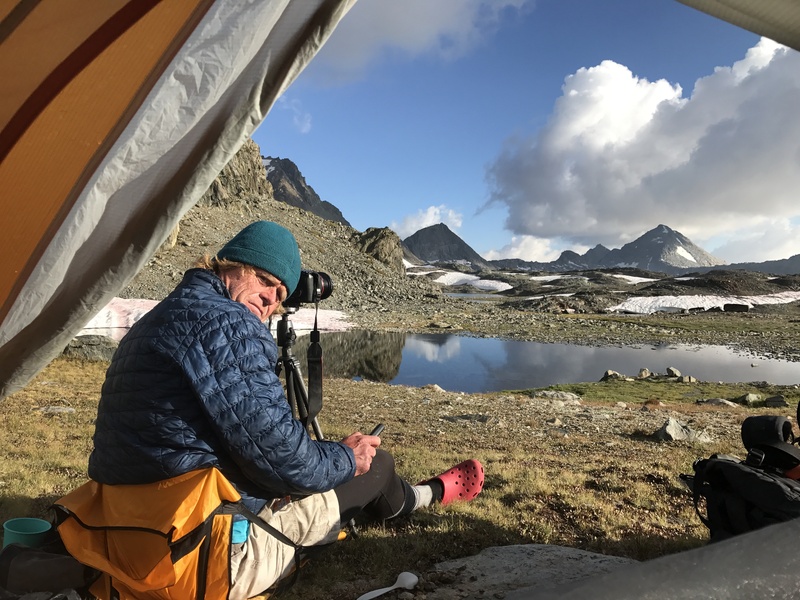 We are in our sixties now, and five of nine days of rough cross-country travel over miles and miles of talus (and this year snow) with heavy packs, requires "one careful step at a time". 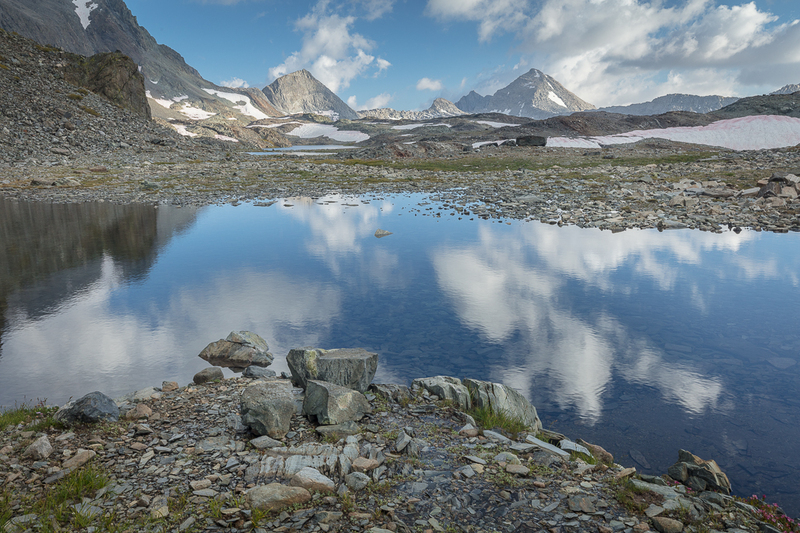 The photo to the right was from a pass leading to the White Divide from Martha Lake. We have explored and climbed the Sierra Nevada together for almost forty years and still feel most "at home" deep in the range. For those of you steeped in the history of the range, we have playfully nicknamed ourselves "Lucy and Bolton" after a mountain couple who roamed the Sierra over a century ago, and made the first ascent of Mount Clarence King in 1895. And more small "steps" for the camera too. It is a LONG process to become a truly proficient photographer, do not be fooled by all the Internet information that you can find these days. To truly "feeI" is the hard part; it takes years of "steps". I hate to say this, but MOST gorgeous wilderness images are made from the car, or a short distance away from ones' vehicle. We really need to be mobile, to find the best light, the best locations, and then be there at the right time. And one needs clouds too, I was quite lucky on this excursion. The back-country is a hard place to make truly great images. As I have mentioned before, It takes much more than just a "beautiful" setting. 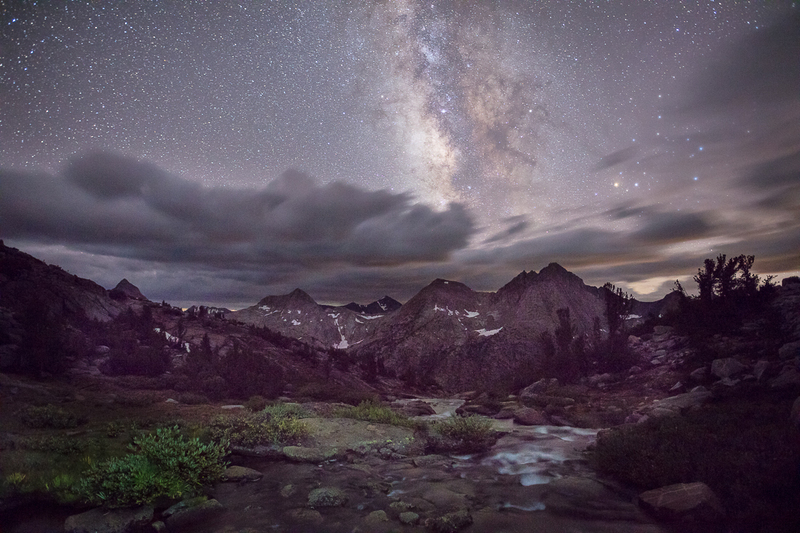 I made this capture of the the Milky Way and the remarkable Evolution area at a small lake above the John Muir Trail. Here is another image from the west side of Mount Goddard in an unnamed lake basin. The top capture was made from the "heart" of Goddard Creek in amazing light. The trip was very cold too, we had six nights over 11,000 feet, with thunderstorms and lighting most nights. I had ALL my clothes on (a big down jacket, my raincoat, a down sweater, and full lifa too) for this panoramic. Our whole trip was very rewarding, being out there with Margaret and revisiting old locales. All the best in your travels, and photography.